ITALY’S REBEL ALLIANCE TO RESTORE THE REPUBLIC? In one of our previous economic reviews (Italy’s rise of the Populist) we wrote about each of the political parties challenging for political control of the country. The outcome of the election was that no one party had sufficient votes to form a government. Howeverm since the election, Italy’s two emboldened populist parties, The Five Star Movement and far-right The League, have been locked in discussions trying to form a coalition government. As confirmed today, a coalition has been agreed and Italy is now the first significant EU member state with an anti-Euro movement at the heart of government. Understandably, this partnership is ringing alarm bells in Brussels, with the coalition government looking to return Italy to a pre-euro setting; reversing agreements made in the Maastricht treaty and adopting policies that could potentially reintroduce the Lira. Most of the details emerged on Tuesday night but the ground keeps shifting. A draft version of the negotiation text between the two parties was leaked highlighting a €100bn fiscal stimulus programme and the potential for the country to run a dual currency system. The so-called “mini BOT” is a fiscal currency which can be used to pay taxes and public sector entities but cannot be exchanged for Euros. In theory, it would increase the amount of money in the system oiling the wheels of commerce. The fiscal stimulus would mainly be delivered through income tax cuts, social security giveaways, the abolishing of pension reforms and a break in VAT rises due to come into effect in 2019. These rumours have caused concerns for investors with Italy already being one of the most indebted economies within Europe. Currently, its debt to GDP ratio is sitting at 130%, so extra fiscal stimulus would add to its debt pile. 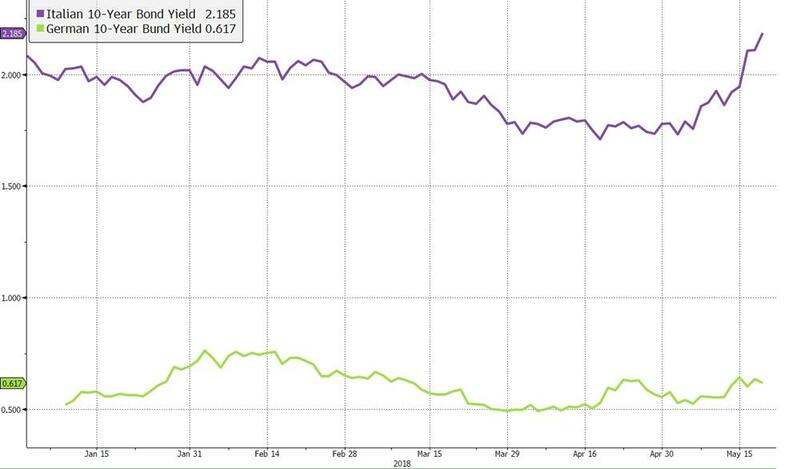 In bond markets, the yield on Italian government debt is 2.2% with the spread between Italian 10-year government debt and German bunds at 157bps. 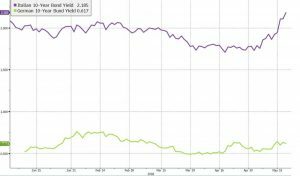 Despite scary headlines about ‘spikes’ in Italian bond yields we can see from the chart that the reaction of the bond markets does not convey undue distress or panic, it simply shows a heightening of risk. Most commentators say such a dual currency system would be very hard to implement politically. The introduction of a dual currency system would compromise Italy’s position within the Eurozone but even so, Italy’s overall exit from the European Union is not considered likely. The EU has had to deal with an issue like this before. In 2015 Greece proposed a dual currency strategy but it was quashed. This is an intriguing new development because Italy is in a very different situation to Greece. For a start it is a net contributor to the EU, something Brussels will have to consider carefully. Each new challenge to the status quo in Europe chips away at its fabric. The current challenges may convey some advantage for the UK. With Italian discontent in the background the EU could find itself on the backfoot and more desperate than they portray to avoid the UK crashing out of Europe without a deal. With so much data accumulation going on day to day, standing back from the noise looking for key signals is never an easy task. There are always numerous data points to examine. Market participants also factor in their expectations ahead of news to be released. This makes matters topsy-turvy – good news can turn out to be not as good as expected, and vice versa. So, standing back, where are we now? Well, noise levels are highly elevated around domestic and geopolitical matters. Chatter about slowing global growth has grown, accompanied by reams of data which point this way and that way. 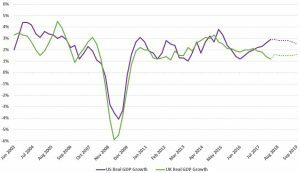 There is also discontent, espoused mainly through the traditional media, about the lacklustre performance of the UK economy. In terms of interest rates, inflation levels and labour market data our observations and conclusions differ from what we hear from the media. We see grounds for optimism. Economic growth remains synchronised globally. Most forecasters expect this to continue, not at the same fast pace compared to the tail end of 2017, but still growing nicely. Worries about slowing growth, trade wars and real wars are part of complex and shifting human values. In the meantime, businesses are getting on with what they do best – allocating capital to create jobs and wealth. The path for each economy is of course very different. For example, we highlighted the plight of Argentina and its poor economic trajectory in our note last week. The future path for them will be extremely rocky, for a period, but hopefully without any major spill over effects. This week we decided to focus our attention on UK data readings and readings for the US because, as the saying goes, ‘If America sneezes, the world catches a cold’. We start with Monetary Policy. In the US, the Federal Reserve Bank (Fed) is reversing its Quantitative Easing (QE) programme. Until very recently the Fed lowered interest rates to historically low levels. This is now changing, with the direction of travel being up, not down. At the same time, the central bank is no longer injecting money into the economy through QE. Both monetary tools have helped stimulate economic recovery from the depths of the global credit crisis. The signal from the Fed is that these tools are no longer necessary. For some time, the Fed has been increasing interest rates, gradually, and reducing the amount of bonds repurchased each month. At the same time, they are taking lots of different factors into account to help judge what is the right future course to avoid derailing economic improvements already underway. The aim of the Federal Open Market Committee (FOMC) is to maintain stability by controlling the inflation rate at somewhere around the 2% level. They also want to ensure healthy and robust growth. It is worth recalling that the FOMC has managed to push through 6 quarter point rate rises over the last 3 years, without hurting the economy. The situation in the UK is different. The Bank of England (BoE) is keeping unchanged its QE programme, which pumped £435bn into the economy. They are, for now at least, stuck with ultra-low interest rates; remember interest rates were cut shortly after the referendum vote to leave the UK and brought back to the same level (0.5%) a year later. It isn’t easy for the BoE’s Monetary Policy Committee (MPC) to raise rates at this juncture. They are in a trickier spot than the US which has a much larger economy that is at a more advanced point in the cycle. We do recall how the US also struggled in its attempts to wean the economy off QE and to shift policy from reducing to raising interest rates. The UK could be said to be following a similar faltering pattern. The economy is lagging as the cycle matures but we are getting positive signals in certain areas. The jobs market is healthy with wages picking up and signs that businesses are confident enough to start investing. We also have a clear signal from the BoE that they are inclined to raise interest rates but only when the time is right. They want to have flexibility in the years ahead to drop rates again from a higher level, if and when the economy faces a downturn. In conclusion, ‘soft’ economic data and the Brexit cloud is painting a different landscape for the UK versus the US. Both economies are at different stages of their recovery from the global credit crisis and the way they are rolling back emergency measures to stimulate growth. This leaves the MPC in ‘wait and see’ mode.